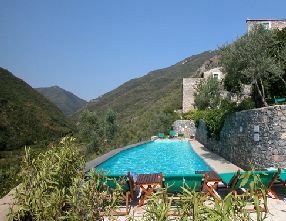 This unique community, 20 minutes from the lively riviera towns of Alassio and Albenga, in the stunning Maritime Alps of Liguria, has a wonderful restaurant/Osteria, shared swimming pool and sauna. Ourplaceinitaly.com is in the heart of Colletta, by the village square and next to the osteria at the centre of Colletta’s great social life. Over a glass of local wine expect to mix with locals and visitors from around the world. 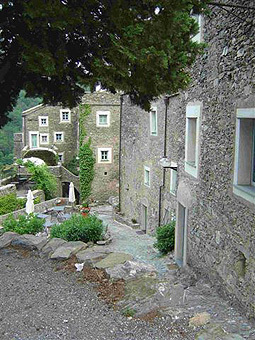 Here, you are within walking distance of the famous rock climbing area of Castelbianco and half an hour from Finale Ligure. The beautifully decorated one-bedroom apartment sleeps four. 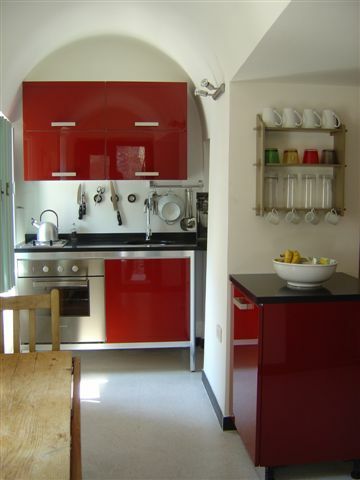 It has a modern kitchen, with full oven, two-ring hob and fridge and dining area for four. The white-washed living room includes a double sofa-bed, a flat screen TV and home cinema for DVDs, CDs and MP3 connection. 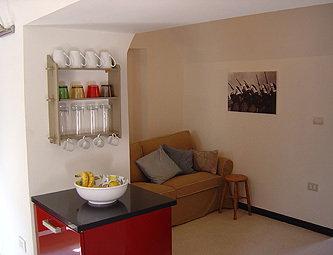 A hand-crafted desk area is perfect for laptops and the apartment has wireless connection to high-speed broadband. The terrace features magnificent views of Peso Grande, the 1023m mountain opposite the village. There is a more private porch area for enjoying breakfast and morning coffee.